A perfect dish after the excesses of Christmas – wholesome, healthy and delicious. 1 Heat the olive oil in a large saucepan, add the onion and carrot and cook over a medium heat for about 5 minutes or until the vegetables have started to soften. Add the mushrooms to the pan and cook for a further 2–3 minutes. 2 Add the canned tomatoes, stock cube and water to the pan and bring the mixture to the boil. Reduce the heat, cover the pan and simmer the soup for 12–15 minutes or until the vegetables are tender. 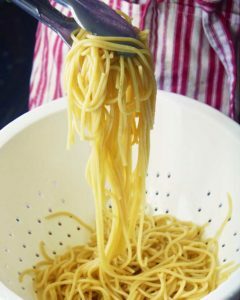 Break the spaghetti or noodles into pieces and add to the pan, then boil the soup, uncovered, for 2–3 minutes, or until the pasta is cooked. 3 Stir half of the pesto into the soup and season to taste with salt and pepper. Pour into a serving bowl and sprinkle with the Parmesan cheese and remaining pesto just before serving. If the soup thickens too much, add a little extra boiling water. The soup may thicken after freezing; again, add more water. You can use ordinary spaghetti, but it will need to be added at the beginning of step 2. You may need to add more water. Recipe taken from Clever Cooking for One or Two.